cooking with wine helps to achieve best results. To bring out its aroma, wine should be boiled down significantly during preparation; which means reduce red wine by at least half from what you start with and white wine by even more. The alcohol evaporates during cooking, while the flavor concentrates. This can be done while cooking a ragout for example, or, in case you are preparing a sauce separately, during deglazing and simmering. Which wine is best for cooking, and under what conditions? Do not use the cheapest or the most expensive wine. Use only wines in your cooking that you would enjoy drinking. The complexity of a premium wine will likely not be recovered after the cooking process. Just like it does not make sense to use the best olive oil for cooking and roasting - why cold press only to reheat again? It is generally a waste to use a premium wine for cooking and the money saved would be better invested in other quality ingredients. If you are cooking with wine to prepare a wine-based sauce, you can definitely use a good-quality wine, given that it is the most important ingredient. 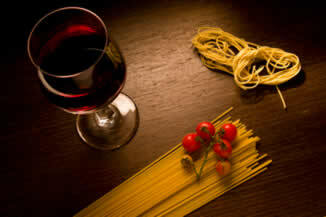 Certain recipes, for example barolo risotto, call for a good-quality and consequently, more expensive wine. If purposely adding wine late in the preparation to recover the alcoholic character and along with it the tart flavor of a dish, you can definitely use a more noble wine. However, the character of a wine does not automatically transfer to the prepared dish. When cooking with sparkling wine for example, only the taste molecules transfer, while the bubbliness dissipates when subjected to heat. Only cold processing, i.e. in desserts, preserves the bubbles. Amazingly, corked wines are quite suitable for cooking. Heat and reduction cause the cork taste to disappear and in that sense, expensive wine is not wasted. In general, red wines naturally have more intense aromas than white wines and go nicely with dark meats, game, roasts and rich sauces. 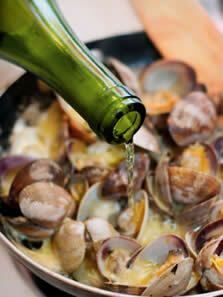 If the white wine is light and dry, it can give creamy and light dishes the necessary acidity needed. Sweet white wine does not work well in this case, or for fish for that matter, and would be better paired with dishes that have a sweet note, such as pork, poultry and of course, desserts. Chicken or veal goes with either, red or white, depending on the character of the dish you are cooking. When cooking with wine keep in mind that this is an ingredient adding intense flavor. Care should be taken in the amount of wine used, as too much can be overpowering. Wine does not belong in every dish: it would becompletely overpowered by salty foods, and it does not contribute anything to smoked or acidic dishes (vinegar, citrus), as its main characteristic (acidity) is already plentiful in these dishes. Some delicious vegetables such as spinach, artichokes or asparagus may be overpowered by the acidity and intense flavour of wine. Even drinking wine is suitable to only a limited extent in this case. Brandy, liqueurs or rum pair better with sweet dishes than wine (i.e. ambrosia salad with rum).